Yesterday I traded my old iPhone 5s for a MacBook Air 11“ Mid 2011, running MacOS High Sierra 10.13.6. Only problem is, the MacBook was purchased in Turkey so its system language is turkish. However I‘m located in Germany and dont speak a word in turkish. 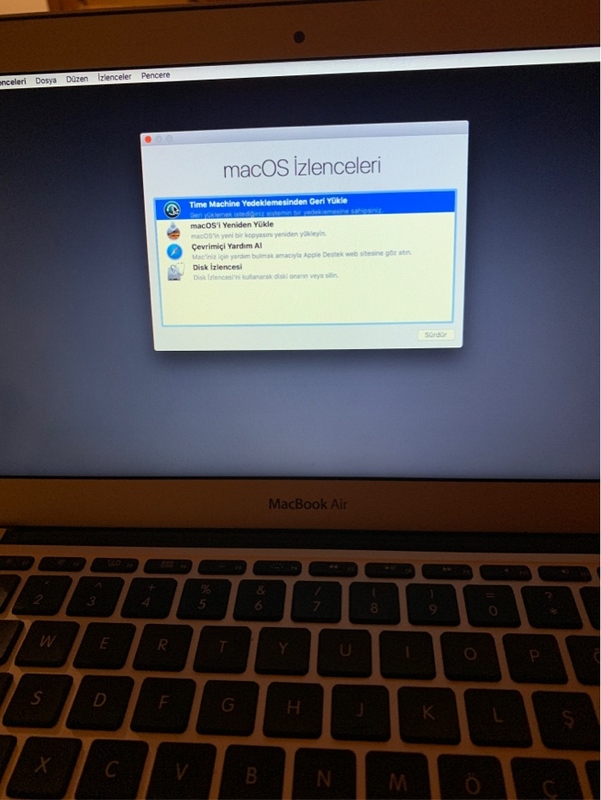 When I try to reinstall MacOS the machine restarts and it opens a window completely in turkish where I can select a Backup from Time Machine (Time Machine is the only English word in the window). I dont know what the rest of the buttons do. Question: How do I change the language of the OS (not the Desktop-Part of the OS but the part that runs when repairing/reinstalling? You can try sudo "/System/Library/CoreServices/Language Chooser.app/Contents/MacOS/Language Chooser"
then choose the system language you want. Update: I tested it myself. The above command is only valid for "macOS", it will change the login screen and shutdown message etc. And the language of "recovery mode" is not associated with "macOS". If you want to change the language of "recovery mode". Just follow the picture,first click File(Dosya) then choose 'Change Language'. As others have pointed out, just to change language, an OS reinstallation is not necessary. However, from a security perspective, a complete reinstallation is considered necessary given the situation you describe. Basically, the MacBook you have received must be considered compromised. One can easily imagine scenarios where the current installation contains some form of malicious programs (e.g., a key logger sending all your passwords somewhere). This may either be due to malicious intent of the previous owner (they installed it on purpose before trading the laptop) or the previous owner may have unintentionally had some virus, malware, etc. Therefore, wiping the system and reinstalling it is very much recommended. Not the answer you're looking for? Browse other questions tagged macos macbook high-sierra language . Is it possible to recover “Could not find APFS system volume handle!” which is reported in verbose mode?